Product Junkie Diva: Worth buying again? 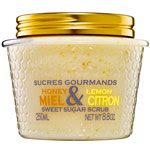 While browsing through a store I came across the Honey and Lemon body scrub by L'Occitane. This scrub is really gentle and it definitely smells like lemons & honey so the scent is ok in my book. However, I was not blown away by this scrub because it was just OK. The scent isn't bad and the grains are not rough on my skin and that's about it.This scrub is nothing special, the scent doesn't even last long after you leave the shower. I also didn't notice any extra smoothness that I could attribute to this scrub. Would I repurchase? Probably not but if someone were to hand this to me as a gift I wouldn't turn it down. If I saw this product at 50% off, maybe I would purchase it myself. You will pay $34 for an 8.8 oz jar.